1. Variety selection is important. Creoles, softnecks, artichokes, and Turbans are more tolerant of our warm winters than most hardnecks or rocamboles. I usually grow Turbans (Shilla this year) in part because they harvest the earliest. I can have them fully cured before the humid, rainy summer weather starts. 2. Even with the right garlic variety, it helps tremendously to vernalize seed garlic for several weeks immediately before planting. I can get away with 6-8 weeks of vernalizing in colder years, but 10-12 weeks of vernalizing works even in warm years. For zone 9b, I would definitely try to vernalize for 10-12 weeks. Vernalizing “tricks” the garlic into thinking that it has been through winter already. Then when the garlic is planted, ideally in October or November, it “thinks” that the mild Florida winter is a nice long spring and grows happily all winter long. Vernalizing is easy: put your intact heads of seed garlic in a paper bag in your refrigerator. You want to keep the bag away from fruits and vegetables that produce ethylene gas, so don’t put the garlic in the crisper or produce bin. DON’T put the garlic in the freezer! After vernalizing, wait to take the garlic out of the fridge until you are ready to plant it, because it will sprout immediately. You might need to shop around to find a vendor who will ship your seed garlic as early as possible, since most won’t ship until September. That’s too late for the full vernalization period. One last tip: mulch your garlic deeply. In warm Florida winter/spring weather the soil can get warm too early in the year. High soil temperatures can cause early bulbing, leading to undersized heads. A nice thick layer of organic mulch keeps soil cooler. 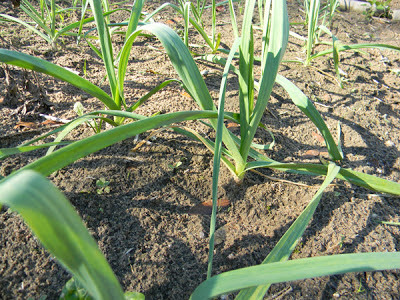 For more reading: http://www.gourmetgarlicgardens.com/warm-winter-growing.html and http://greyduckgarlic.com/Southern_Garlic_Grower_Guide.html are great resources. She proves yet again that just because I haven’t figured something out it doesn’t mean that it can’t be done. If anyone else has had success, please chime in. When I grew it with limited success, I just planted cloves from the supermarket. I know, that was not very scientific of me. Truth be told, I never gave much time to garlic as I was focused more on yams, corn and pumpkins, along with testing perennial vegetables. It’s a very important herb with great healing qualities (Marjory has a free report on the power of garlic which I keep meaning to read) so I should have done better with my homework. Thank you, Laura. Another big thank you to Laura for this! I’ve had garlic in my spare refrigerator for over a year, trying to find info on growing it here in Florida. Well, there is also the bit about goat-proofing my garden – still working on that one, but we may be almost there. Oh, wow. I didn’t expect so much attention! You’re welcome, David and dfr2010. Dfr2010, I worry about the viability of your year+ old garlic. You might want to get some fresh garlic to plant this fall. At least as a backup, in case your older garlic doesn’t make it. I hope you grow some great garlic, and good luck with the goat-proofing! It was a good comment, Laura, and it’s obvious you’ve thought it through. Laura, I live in south Santa Rosa County. (Lower Milton). Where do I find the right garlic to plant? I need to find it soon so can put it in refrigerator for the 10-12 weeks before planting the end of October. None of our nurseries will even carry them until late September. Do I need to order them & from where? Thank you for getting me started with this project. I order mine from http://www.foreveryongfarms.com, and I ask for early shipping, explaining that I need to vernalize. I got mine this year in late August. I order early (in July), so I don’t know what their turnaround time is when you order during the shipping season. They sell Southern-adapted garlics. Their Creole garlics sell out early every year, but they still have turbans, artichokes, and other softnecks in stock as of this morning. Also, if you grow extra and have good results, you can save the best heads to replant next year. I’m going to be growing a mix of my saved garlics and some new-to-me garlic this year. I order my garlic from https://www.filareefarm.com/ because they have a great selection of softneck varieties for here in Florida. I have had varied results here in Alachua, probably mostly my fault. This year I planted Inchelium red and Sicilian artichoke varieties, now I wait. Thanks for the info on vernalizing, it’s worth a try! You’re welcome! I hope that vernalizing gives you more consistent good results. Thanks for the tip on Filaree Farm – it’s always good to have another source for nice garlic. Wow, they have a BIG selection of Turban garlics, too!